Hello again and welcome back to my continuing MTG Finance series “Bang for your Buck” where I look at the cards currently seeing play in standard and speculate whether I think their price will go up, go down, or remain the same. Today’s article marks a special turning point in MTG Finance. We are moving into uncharted territory where the sets will be rotating in 16 months instead of the regular 24. Khans of Tarkir was a special case, but Fate Reforged will be rotating out in Spring of 2016 at the end of March (I believe). Theros block will be gone in September/October this year (you should start thinking about selling your Theros block cards now), and Khans of Tarkir will be gone 4 more months after that in Spring (20 months instead of 24?). We should be safe on the KTK cards until fall, but just keep that in mind when you are buying cards to spec on or if you expect cards to hit a second spike after their initial fall. I thought I’d do something a little different this time since I never get the chance to really talk about the cards that just came out. I’d like to share a few pictures of cards I bought during the release of a new set, talk about how much I bought them for, and what I plan to do with them. There are some cards that I might try to turn around and sell right away, and other that I think are good long term investments. As I said above, FRF is only going to be played for about 18 months. Khans of Tarkir was the big set, and therefore we won’t be opening as much of the second set. I plan on being a lot more selective when buying cards in the future and not investing so much money. The cards I invested for my Mardu decks have already shown to be a good choice. I ended up buying the Crux of Fate for 290 yen, the Mardu Woe-Reapers for 59, the Brutal Hordechief for 1089 and 1200 yen, and the Mardu Strike Leaders for 250 yen. Crux of Fate has already shot up to 500-600 yen in Nagoya, and the Hordechiefs are going for 1500+. 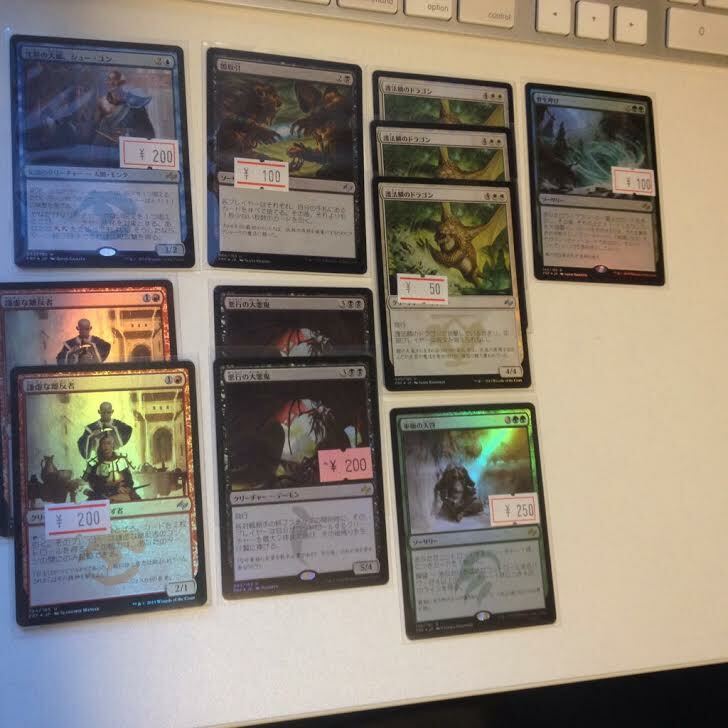 I’ve also picked up Pre-release foils of Torrent Elemental for 800 yen, Warden of the First Tree for 680 yen, and a few other uncommons such as Temur Sabertooth and Humble Defector for 10-20 yen each. During my first stop in stores at a release day, I was a little late. Cards like foil Humble Defector were already scooped up, so I ended going with these uncommon dragons and Harsh Sustenance. With Dragon’s of Tarkir being the next set, I’m sure we’ll see a lot of powerful dragons, meaning more casual players playing with dragons, Dragon EDH decks, and maybe even some standard playable dragon decks. They are around $1.50 each online now, and I think they have some space to go up even further (I am disappointed that all the Destructor Dragons were bought out though). For Harsh Sustenance, I really think that card will see some play eventually, either in BW tokens in Modern or in a tokens deck in standard. I only spent $2 on 10, so I can stand to make a lot if they do see play. At the next 2 stores I visited, I got a little bit luckier. I found Humble Defectors at 200 yen, a few more of the white dragons at 50 yen, and a Dark Deal for 100 yen. Shu Yun also seemed like a good deal. His current price in the USA is about $7.50, and I think he’ll find a deck eventually. Archfiend of Depravity also seemed like a good pick up at 200 yen. Its ability seems really strong, and reminds me a little bit of Desecration Demon. 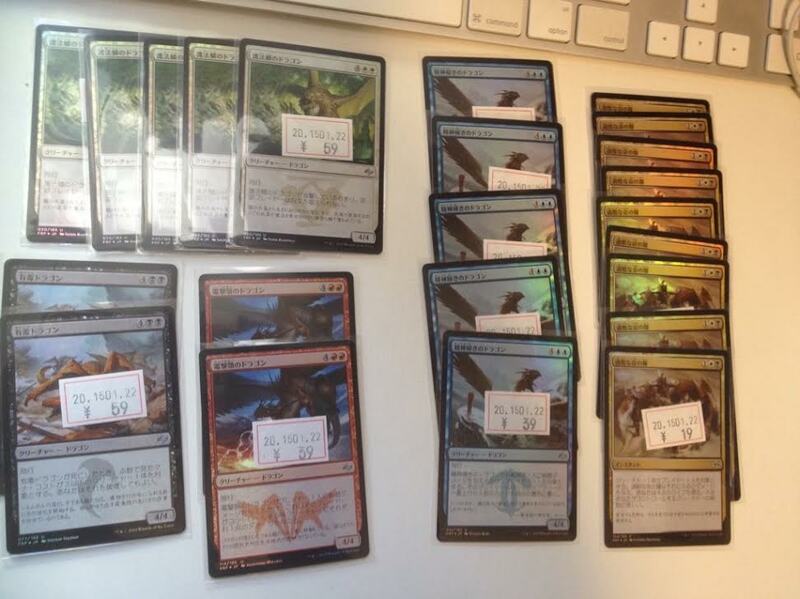 That card also started at about 80 yen when Return to Ravnica came out and shot up to 600-800 yen at its peak. I’ll admit that the Shamanic Revelation and Wildcall were impulsive buys, but I thought they might see some play in EDH decks later on. It wasn’t like it was setting me out that much money. I’ll be waiting on these for a few months. My final pick ups came on Monday, the day after the SCG Open in Washington DC. 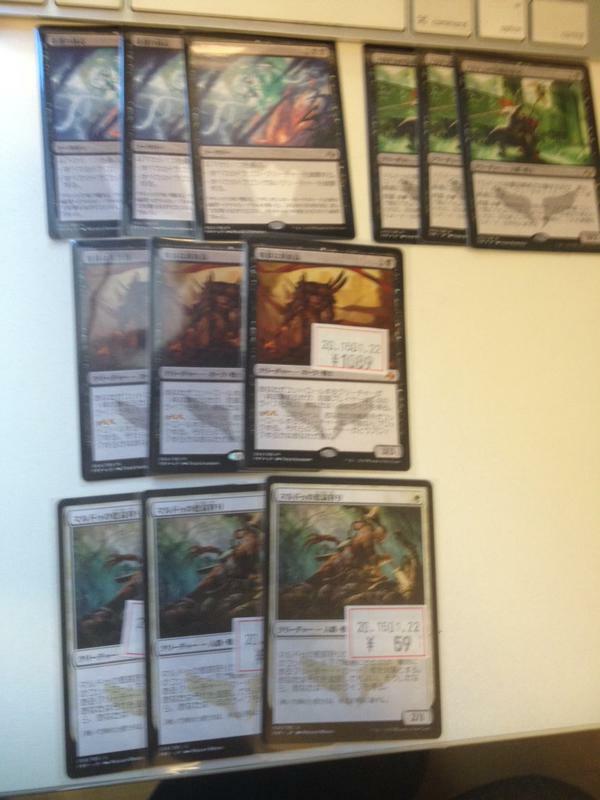 I found a couple more foil dragons to sit on, Dark Deal Foils for 59 yen, an Arcbond for 89, Temur Sabertooth for 89, Mob Rule for 89, and some Tasigurs for 259. I found another playset for 350 yen and ended up buying those at another store too. I also decided it wouldn’t hurt to get Daghatar for 20 yen each, just in case he ends up seeing play. I also got another Yasova for 159 to raise my total to 3. Mob Rule seems like it could see play in EDH, Temur Sabertooth in the new Temur Ascendancy deck, and Arcbond well . . . we’ll see. All are worth hanging on to you for a few months, so I’m not ready to sell into the hype just yet. I held onto my Foil Treasure Cruises for about a month before trading away 4 of them for a SP Force of Will. I ended up spending about 5000 yen total over the course of the weekend, but I feel like I’m set for the next standard season. I used a lot of my point cards and discount tickets to get cards, so I saved a lot of money this time around. I also ended up selling some Soulfire Grand Masters for 1400 yen each on release day and a foil for 3000 yen, but I think I should have waited until after the weekend to do so since they have went up in value a little bit. Well, lesson learned, but at least it reduced the cost of my box by about $60. Elspeth, Sun’s Champion – I said Elspeth should hold her value at around $22 or so, but that statement was made before they announced the Kiora Vs Elspeth duel deck. She’s dropped to $20 which isn’t too bad, but you definitely shouldn’t expect her to stay there for much longer. Brimaz, King of Oreskos – another card I expected to hold its value, and it did. It’s still selling for a decent chunk of change here in Nagoya (2500 yen in some stores), and I think he’s going to see play this spring. Soldier of the Pantheon – He was about $3-4 during the start of Khans, but has dropped to bulk rare status again. Well, it was good while it lasted. Deicide – My spec was this card last time, as I thought we’d see more gods being played in a 3 color standard wonderland, but there really hasn’t been any. Bad call on my part. Hushwing Gryff – I said to pick them up at $1.50, and you save some cash if you did! They are up to $2.50 now, and seeing some play in modern too which should keep their price propped up. A win for me. Launch the Fleet – not much movement from last time. Did hit 300-400 yen for a while here in Japan, but has settled since then. I was a little late to the party with Return to Ravnica last year and held onto them until late spring/early summer and missed the peak prices on a lot of cards. I’m not going to let that happen again if I can help it. I’m recommending right now that you start letting some of those extra Theros cards trickle out of your trade binder and either sell them for cash or trade into some other cards (standard or other). I plan on going down from a playset to 3 cards initially, and if I see a card hit a peak again in the next few months I’m going to sell. Anyways, let’s see what white cards are good to pick up/sell in the current standard environment. I’m going to start off with cards I think you should sell. Ajani Steadfast never really saw a lot of play in standard, although I do like his ability. He’s selling for $8 now, and I’m sure that will start to slowly decrease over the next month or two. I recommending trading him away, though keep one if you think you might use him before rotation. If he doesn’t show up in any FRF standard decks in the next few weeks, let him go. As for Brimaz, King of Oreskos ($24), I think he’s going to see some play in standard again and am going to wait until he spikes again to sell him off. I doubt he can hold the price tag after rotation. Chained to the Rocks ($1.25) should see another spike in the next few months, played in RW heroic or RW aggro decks, so when it happens unload what you got. You might be able to get $2-$3 in the next few months but then they’ll drop to bulk again. I’m also pretty positive that Hero of Iroas is hitting his last spike now at $5 each. I’d sell him now because he definitely won’t keep that price for long. He’s buylisting for 500 in in a few places in Japan, meaning they are selling him for $7-8. Insane. Take mine, please. We’ll still be opening KTK packs, but there will be less of them. 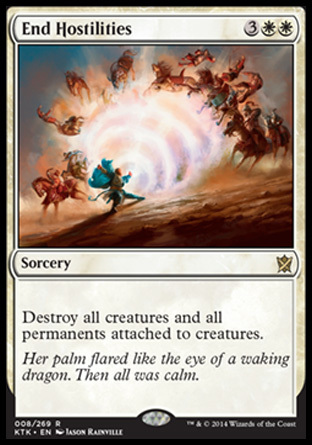 End Hostilities is a bargain at $2 right now, and will be a cornerstone of white control decks over the next few weeks. Supreme Verdict rose to $5-6 at one point, so I could see this going up before the next spring set. The only concession is that it has to fight with Crux of Fate as well. 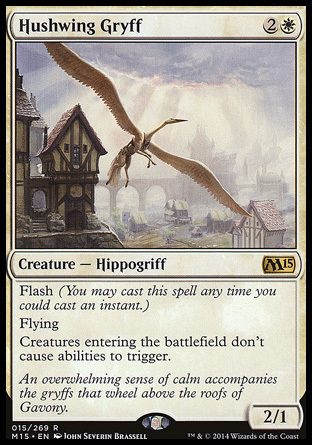 I see Hushwing Gryff ($2.50) getting more play in modern now that Treasure Cruise is gone and decks like GW Hatebears can make a return. It should see some standard play as well, combating cards like Siege Rhino in Abzan decks, and Hornet Queen/Sidisi in Whip decks. Wouldn’t be surprised to see it go up to $3.50. Soul of Theros ($4.50) seems like a sell to me now as well, especially now that BUG Whip seems to be the preferred reanimator deck of choice. Will still see play, but I think his price has spiked already. Tasigur pretty much ensures BUG to keep with the reanimator theme. 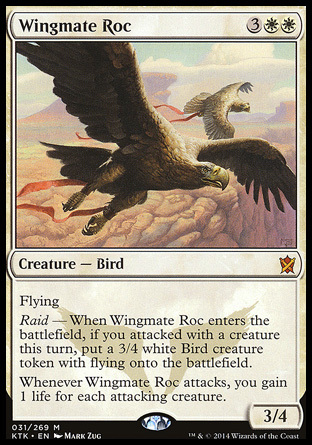 Wingmate Roc seems like a good buy at $9 now. The birds really haven’t dropped lower than 1300 yen here in Japan, and as Stormbreath Dragon’s rotation date this fall gets closer and closer, I think the Rocs value will get higher and higher again. I’m also looking at BW token, Mardu, and RW token decks to take full advantage of him over the next few months. It might dip to $8, but I think you should trade for a playset/buy now if you plan to play with him. Well, there weren’t too many white cards to choose from this time around, but then again we can’t really expect too many of the Theros block white cards to hold up their value much longer. Over the next few weeks is a great time to sell, so hopefully you can get some profit off of cards you aren’t using or reduce your inventory from a playset down to just 2 or 3 so you peg your bets. What do you think of white? Do you have any other suggestions you’d like to throw in? If so, please leave them down below. Next time I’ll be looking into blue cards in standard. Look for it in a few days! Thanks for reading. Unlucky on your Soldier of Pantheon pick. 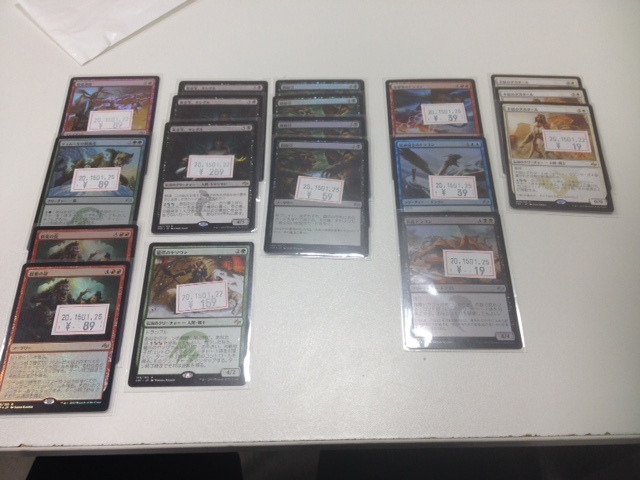 A top 8 SCG deck played 4 of them in a really aggressive list of Abzhan. There should be some demand for him. The foil Humble Defectors and Sabertooths look excellent pick ups.